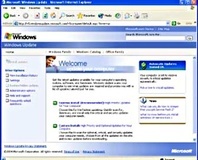 Microsoft has been sued for patent infringement by Israel-based software house BackWeb Technologies over functionality in Windows Update. The stealth update to Windows Update last month managed to break something - the ability to update Windows after using XP's recover feature. Windows Update is accused of downloading and installing files even when autoupdate is disabled. Microsoft responds "Uh, nope." What's ahead for Windows OneCare? The new anti-virus service from Microsoft is getting close to launch. We ask, should Microsoft be charging to protect its own insecure operating system?